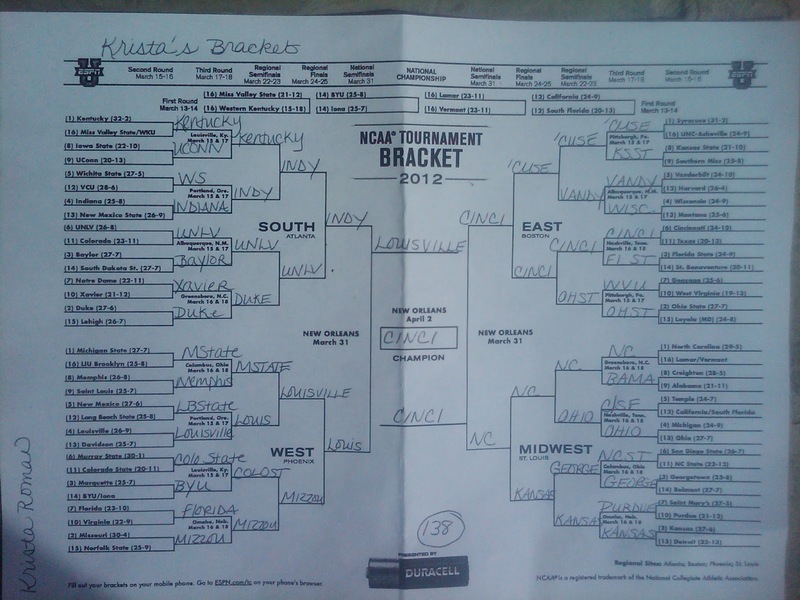 Ever since I was a little girl, I always filled out an NCAA bracket for my Dad's work pool. Even when I was really young, not into the games and only picked winners based on their names/colors/mascots, I always got lucky. I actually think knowing less can benefit you in this type of situation. I can remember many years when I actually won the pool or came in second or third without watching a single game; this, out of a group of male adults who live for sports and every second of every match-up. After many years of watching March Madness, of course I know more now than I did back then. I love sports! Basketball isn't my favorite but I cheered for it for many years, followed it in college and have fun with it now. I don't do as well as I did when I was young and clueless but I still get lucky from time to time. I haven't followed very much of the season this year, so my picks were a bit all over the place. I have a prediction system that parallels what's currently going on in my life and the world. If a certain city has been in the news or a part of my life in any way and that city has a team in the tournament, I go with it. I won't discuss every detail of why I picked my teams but there is a method to my March madness.